By clicking on your name or photo in the upper right corner, you are able to access the following resources. Clicking on your name will take you to your account, and will allow you to edit your profile, upload a picture, update your contact information, designate interests to receive custom recommendations for organizations and events, and edit your privacy settings and notification settings. See the previous section on editing this information. This gives you an overview of your progress in any Co-Curricular program(s) you are enrolled in through Anchor Link. Switch between paths by using the drop down menu under the header. Scroll down to see a detailed chart of your progress as well as an overview of the requirements and potential completion options for any program in which you are enrolled. 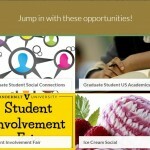 Here, you will see all of the events you have attended and swiped into. You can view the event details, navigate to the host organization page, and leave a reflection for that event. 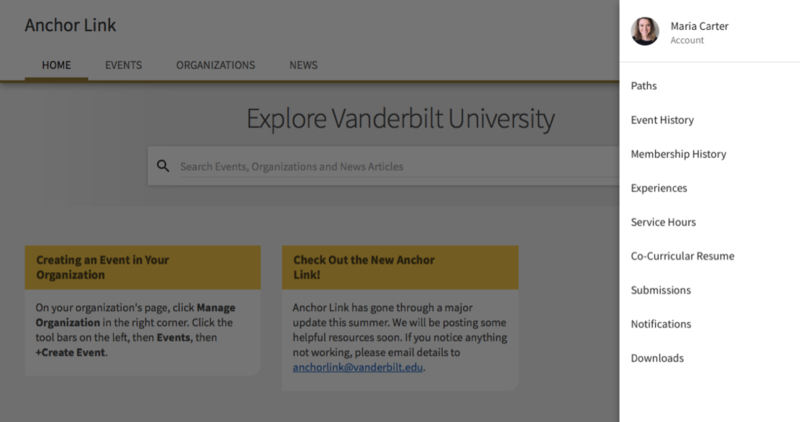 This drop down is where you go to manage your involvement within Anchor Link. From this section you can access and edit your organization memberships. Your shortcuts will display any organization you are a member of within the system. This is the fastest way to get to the home page for any of your organizations. Experiences allow you to track out-of-the-classroom activities, such as awards, conferences, study abroad, internships, or other involvement outside of the institution. 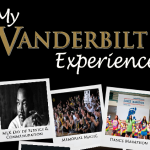 Experiences let you showcase these additional activities on your co-curricular record to share with future employers, graduate schools, for scholarship applications, or for any other reason you might want to share your involvement. This tool allows you to manually submit service hours that you would like to associate with a specific organization you are a part of. These service hours can be included on your co-curricular involvement record, allowing you to showcase your involvement in an organization or in the community. Note that you must be a member of an organization in Anchor Link in order to add service hours within that organization. If you’re logged into Anchor Link, all of your form, election, org registration, and event submissions are saved. Anytime you advance past them to a new page of a submission, it will create a partial record on your submission list (which can be resumed at a later time). Access this page to resume any partial submissions or view the status of completed ones. This is your message inbox within Anchor Link. 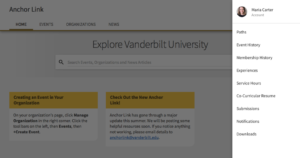 Depending on your notification settings, you may receive messages to both your @vanderbilt.edu e-mail address and your Anchor Link inbox. Any download you request (transcript, event attendance list, etc.) will be listed here for you to access at any time.